Stay up to date and have Large on the Lawn show news delivered directly to your inbox! 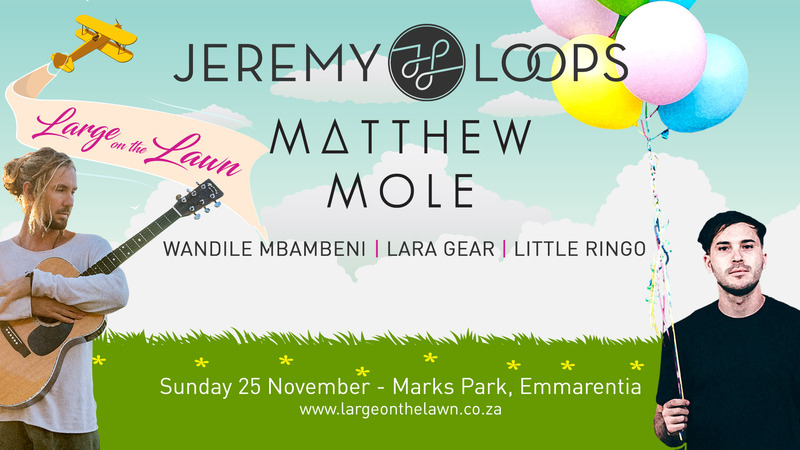 December holidays are on the horizon and there’s no better way to get ready for a much-needed break, than with a relaxing day at Large On The Lawn with Jeremy Loops and Matthew Mole. Large On The Lawn returns on Sunday 25 November at Marks Park in Emmarentia and tickets are on sale now from www.howler.co.za/LOTL2018. Large On The Lawn has become Joburg’s answer to the Kirstenbosch Summer Concerts, creating a beautiful day out with friends and family on a blanket with drinks and snacks, making for the perfect way to spend a Sunday. The third single off ‘Critical As Water’, following Waves and Freak, ‘Gold’ sets the tone for the album with a rousing call-and-response chorus that’s bold and hopeful, against what often feels like insurmountable odds. This battle of staving off hopelessness against daunting odds, weaves together an album that feels like a repeated release from the many pressures society places on us. Loops leapt into 2018 with the massive hit single ‘Waves’ and the release of his ‘Critical As Water’ album which was supported with a world tour, seeing Loops reaching over 50,000 fans internationally and headlining a sold out show at Shepherd’s Bush Empire in London. Jeremy Loops is currently on tour with Milky Chance in North America. July 2016 saw Matthew Mole release his highly anticipated sophomore album ‘Run’. The album reached the No. 1 position on iTunes South Africa and the album’s first single, ‘Run’ achieved Gold Status within 3 months of release. The album ‘Run’ was also nominated for Best Pop Album, Best Produced Album and Record of the Year at SAMA 23. ‘Run’ sees Mole take a different turn from his debut offering, ‘The Home We Built’. This change is evident not only from a sonic and lyrical perspective but also aesthetically. The album has produced hit singles ‘Run’; ‘Holding On’; ‘Light’ and ‘Inside Out’. Opening acts will be announced soon, gates open at 12pm and event will end by 6pm. Picnic baskets and soft cooler boxes are allowed, no liquids allowed, a free water source will be available, as well as a fully stocked bar, and variety of food options. Concert-goers can pack their own food for a relaxed picnic setting.